Happy New Year kids! Today has been a total write off for me, it began with a Macdonalds (obvs) then continued with back to back films and more food, it's New Years Day and this is me so I am bound to be seeing the beginning of 2015 with a hangover. Last night was literally the best, the fancy dress party was a success and everyone made such an effort, I pulled Cruella off worryingly well and now am debating a bobbed, black and white haircut. 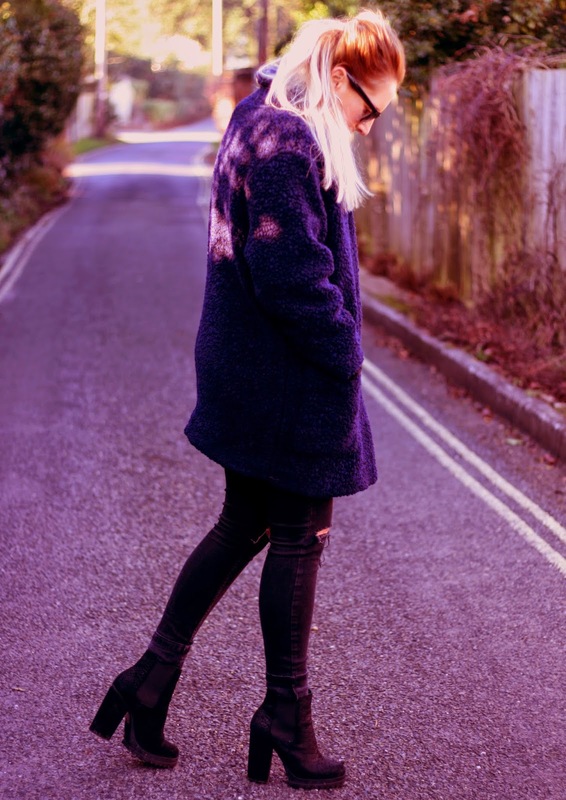 This Teddy coat has been the best coat I have ever bought - it was £80 from Urban Outfitters and that was with £30 off, quite a high price for me but totally worth shelling out for as it's kept me so cosy and warm during the last few freezing cold weeks we have been having in London. Its a lovely shade of navy (my current fave colour) and has black speckled dots all over it, it's probably in the sale now with even more dollar knocked off, I can't look as that will kill me. Whats been your best purchase this season? Happy new year love! I love this outfit, looks so comfy! 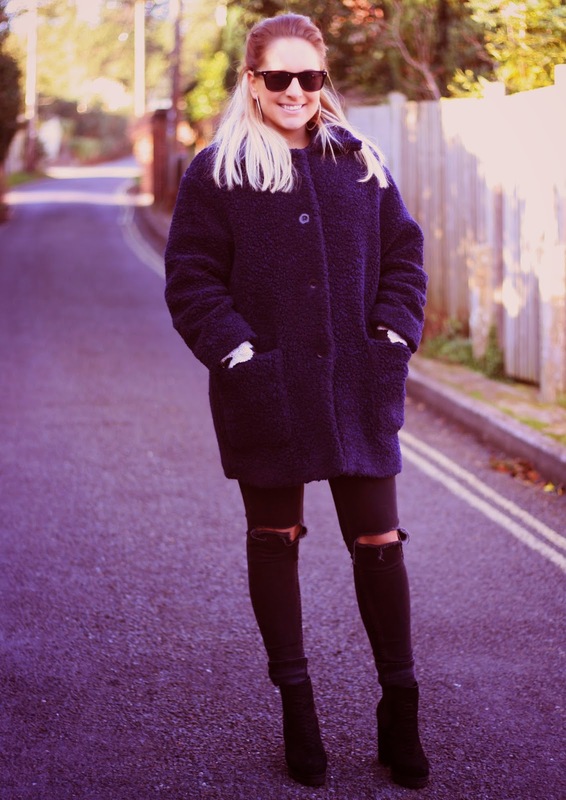 Such a great coat! love your look! Have a great 2015! Love your coat. Looks so chic with your blonde hair & sunnies! My best purchase this season was also a coat I think- a really classic brown faux suede 'grow-up- coat with a tie belt around the waist. Not a style I would usually buy but I adore it now and only paid 30 euros! Love your blog, will be back! Happy new year. Great look! 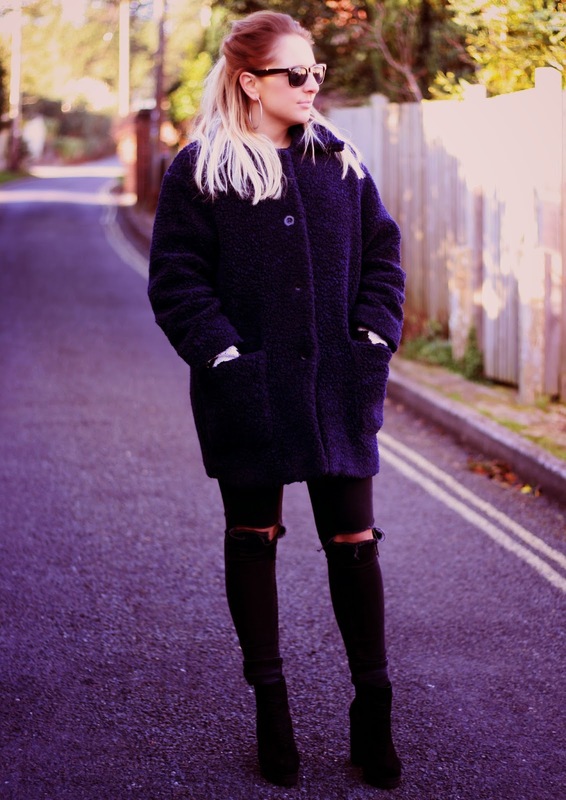 Gorgeous coat and love your sunnies!!! That teddy bear coat is to be coveted! Love this! That coat is totally awesome! i like your coat ! great total look!